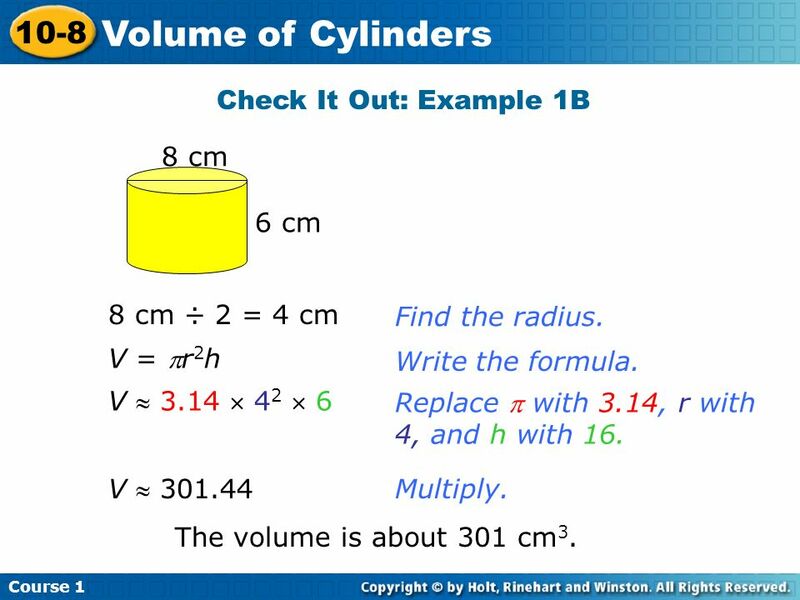 2 Course 1 10-8 Volume of Cylinders To find the volume of a cylinder, you can use the same method as you did for prisms: Multiply the area of the base by the height. volume of a cylinder = area of base  height The area of the circular base is r2, so the formula is V = Bh = r2h. 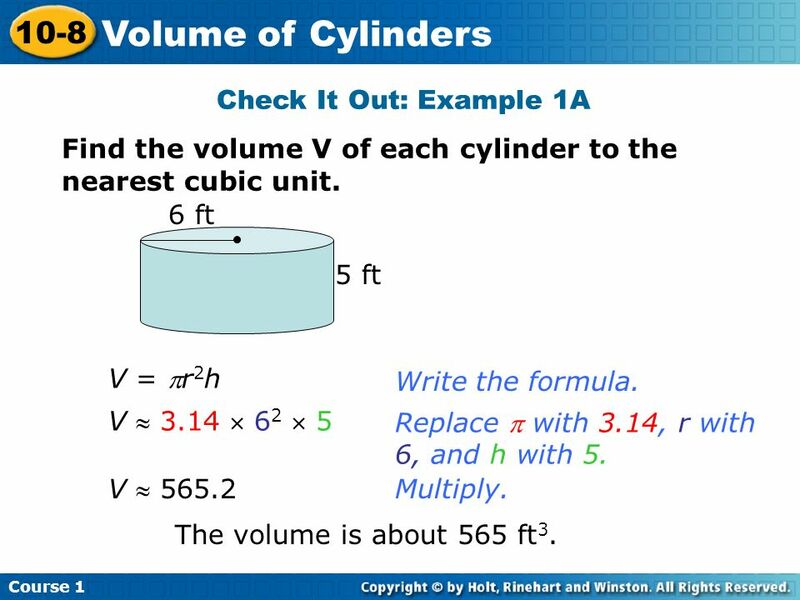 Course 1 10-8 Volume of Cylinders Additional Example 1A: Finding the Volume of a Cylinder Find the volume V of the cylinder to the nearest cubic unit. V = r2h Write the formula. V  3.14  42  7 Replace  with 3.14, r with 4, and h with 7. V  Multiply. The volume is about 352 ft3. 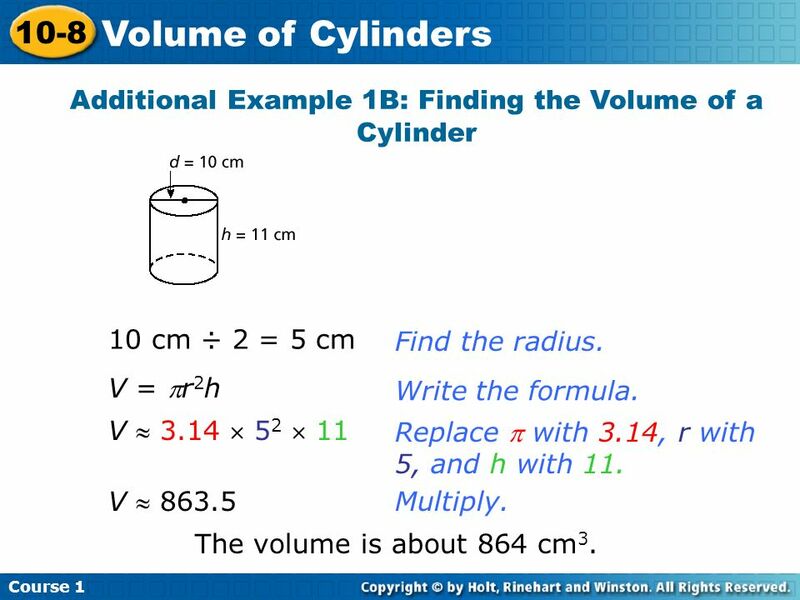 Course 1 10-8 Volume of Cylinders Additional Example 1B: Finding the Volume of a Cylinder 10 cm ÷ 2 = 5 cm Find the radius. V = r2h Write the formula. V  3.14  52  11 Replace  with 3.14, r with 5, and h with 11. V  863.5 Multiply. The volume is about 864 cm3. 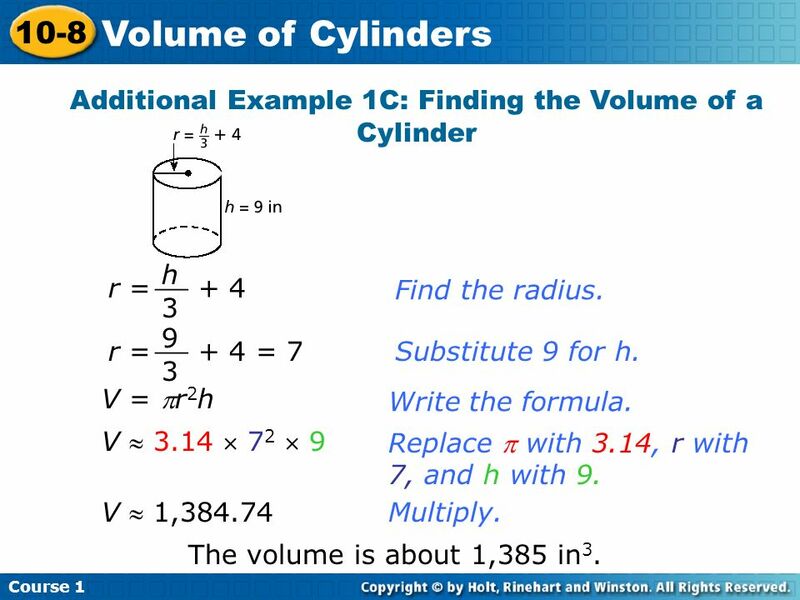 Course 1 10-8 Volume of Cylinders Additional Example 1C: Finding the Volume of a Cylinder r = h 3 __ Find the radius. r = = 7 9 3 __ Substitute 9 for h. V = r2h Write the formula. V  3.14  72  9 Replace  with 3.14, r with 7, and h with 9. V  1,384.74 Multiply. The volume is about 1,385 in3. 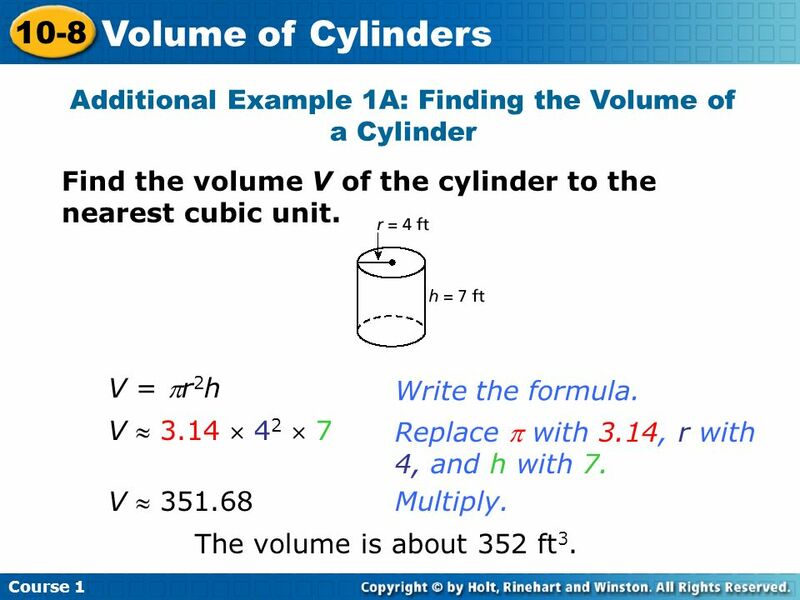 Course 1 10-8 Volume of Cylinders Check It Out: Example 1A Find the volume V of each cylinder to the nearest cubic unit. 6 ft 5 ft V = r2h Write the formula. V  3.14  62  5 Replace  with 3.14, r with 6, and h with 5. V  565.2 Multiply. The volume is about 565 ft3. 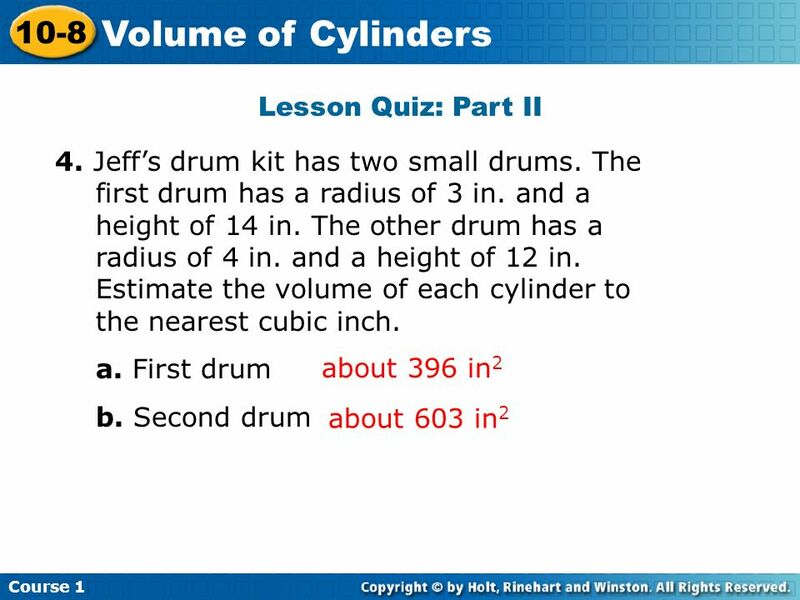 Course 1 10-8 Volume of Cylinders Check It Out: Example 1B 8 cm 6 cm 8 cm ÷ 2 = 4 cm Find the radius. V = r2h Write the formula. V  3.14  42  6 Replace  with 3.14, r with 4, and h with 16. V  Multiply. The volume is about 301 cm3. 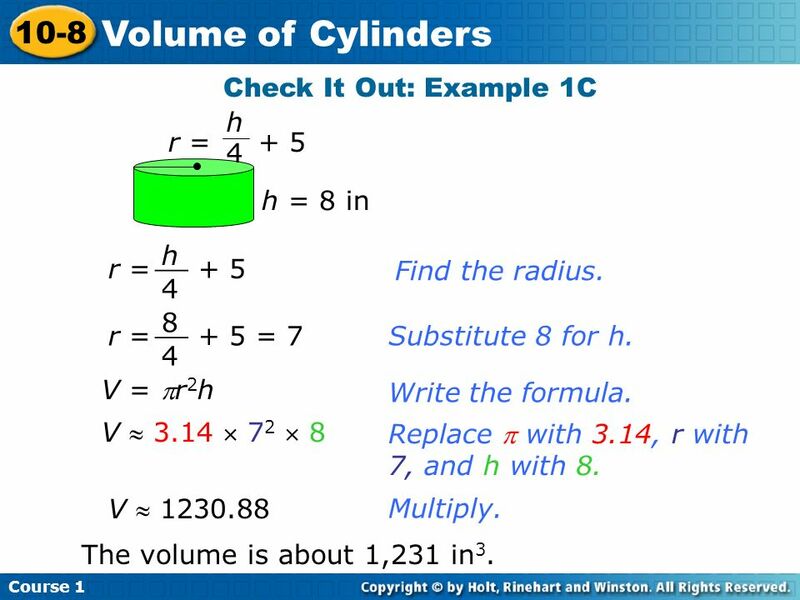 Course 1 10-8 Volume of Cylinders Check It Out: Example 1C h r = 4 h = 8 in r = h 4 __ Find the radius. r = = 7 8 4 __ Substitute 8 for h. V = r2h Write the formula. V  3.14  72  8 Replace  with 3.14, r with 7, and h with 8. V  Multiply. The volume is about 1,231 in3. 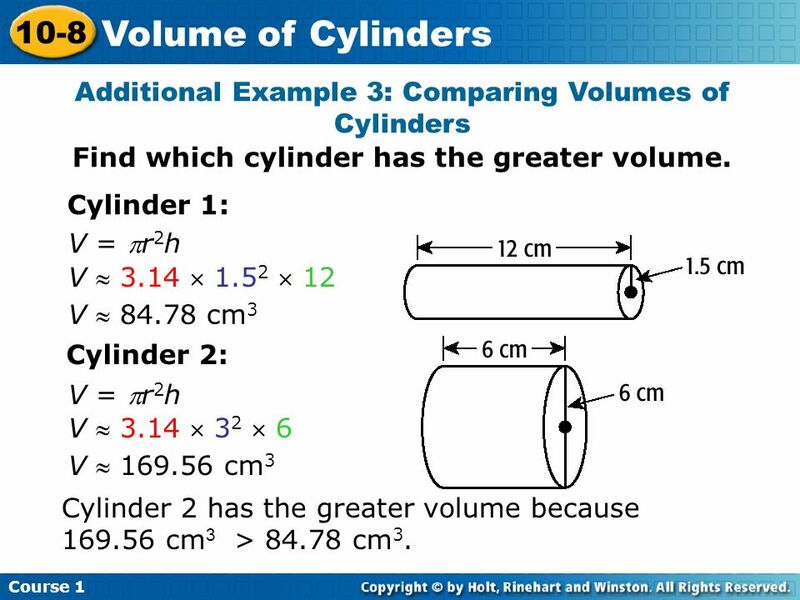 9 Course 1 10-8 Volume of Cylinders Additional Example 3: Comparing Volumes of Cylinders Find which cylinder has the greater volume. Cylinder 1: V = r2h V  3.14  1.52  12 V  cm3 Cylinder 2: V = r2h V  3.14  32  6 V  cm3 Cylinder 2 has the greater volume because cm3 > cm3. 10 Find which cylinder has the greater volume. 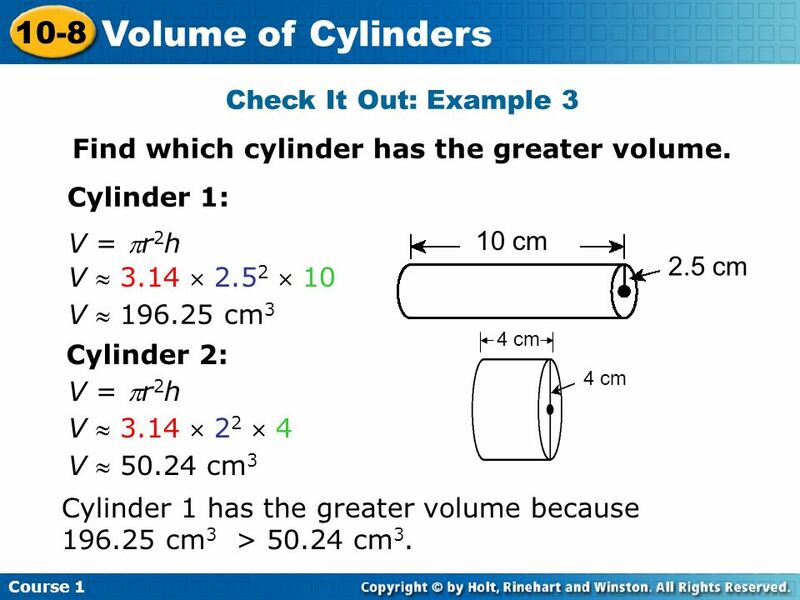 Course 1 10-8 Volume of Cylinders Check It Out: Example 3 Find which cylinder has the greater volume. Cylinder 1: V = r2h 10 cm 2.5 cm 4 cm V  3.14  2.52  10 V  cm3 Cylinder 2: V = r2h V  3.14  22  4 V  cm3 Cylinder 1 has the greater volume because cm3 > cm3. Download ppt "Volume of Cylinders Notes"
VOLUME OF CONES AND CYLINDERS LESSON 25. VOLUME OF A SPHERE LESSON 26. 04/01/11 3-D Figures Entry Task: What are each of these solids called? Holt CA Course Volume of Prisms and Cylinders Warm Up Warm Up California Standards California Standards Lesson Presentation Lesson PresentationPreview. 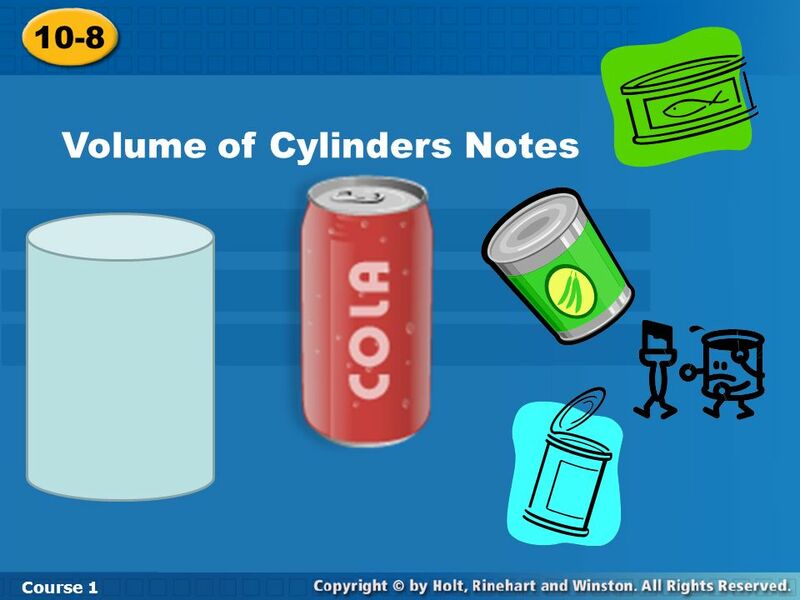 Learn to find the volume of cylinders. 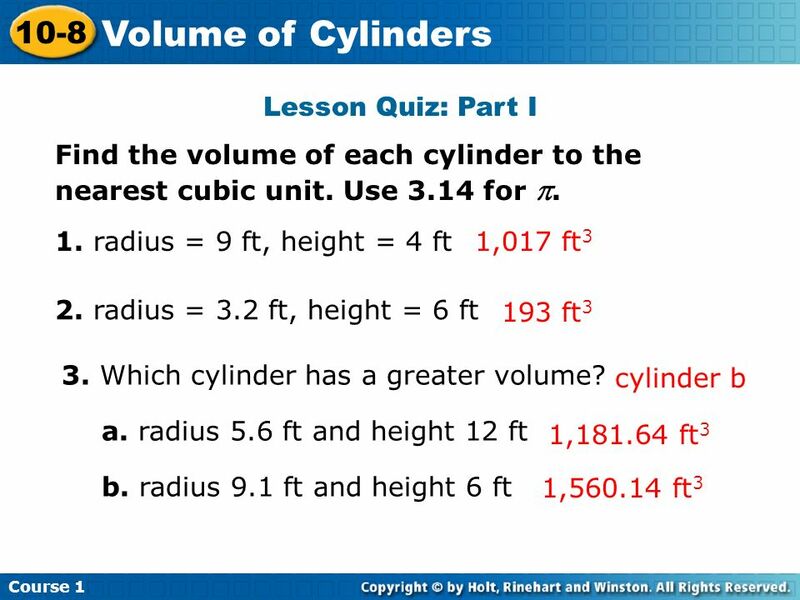 Course Volume of Prisms and Cylinders Essential Question: Describe what happens to the volume of a cylinder. 10-8 Volume of Cylinders Warm Up Warm Up Lesson Presentation Lesson Presentation Problem of the Day Problem of the Day Lesson Quizzes Lesson Quizzes. Holt CA Course Volume of Cylinders Warm Up Warm Up Lesson Presentation Lesson Presentation California Standards California StandardsPreview. 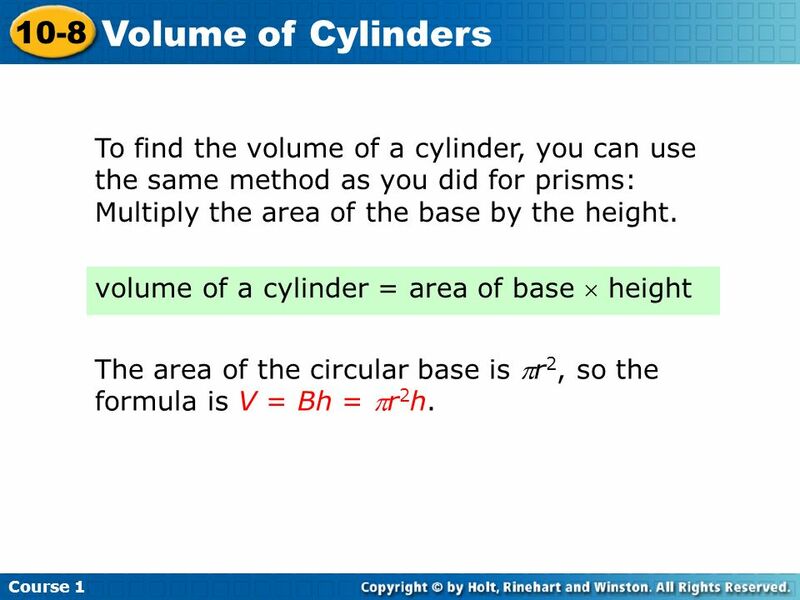 Volume: Prisms and Cylinders Prisms Volume of a Prism = Area of the Base Height h.
VOLUME Learning Target: Students will discover the relationship between the volumes of a cone, cylinder, and sphere. #38. Volume is the number of cubic units needed to fill a space. VOCABULARY. 10-9 Volume of Cylinders Course 1 Warm Up Warm Up Lesson Presentation Lesson Presentation Problem of the Day Problem of the Day.